Is pain beginning to interfere with your day to day activities, stopping you from working or enjoying leisure activities? Struggling to find the time to treat the root cause? You could benefit from the range of treatments provided by Back in the City's skilled Osteopaths with over 30 years experience. EC1, EC2, EC3, EC4 and WC1. Our flexible appointments schedule also means you'll be able to fit osteopathic treatments in during your lunch hour or whenever suits you. If you do, our osteopathic treatments in the City of London are the perfect solution for not only relieving the pain, but also finding the root cause of the problem. The correct and effective treatment follows on from accurate diagnosis and evaluation. A full case history and wide range of examinations help us to understand your problem and its underlying causes. Registered providers for BUPA, AXA PPP, Aviva, Vitality WPA, Cigna and most private medical insurance companies. 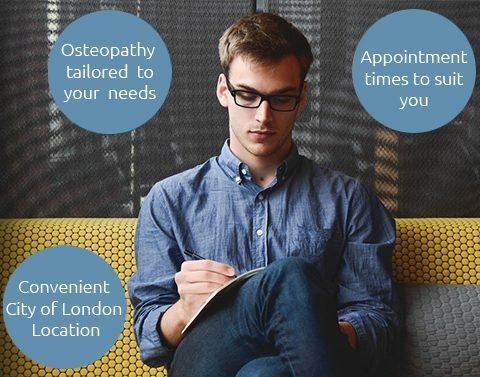 Start benefiting from the treatments offered by our experienced city osteopaths by making an appointment today. Our thorough approach enables us to diagnose and treat a wide range of injuries and ailments effectively. Whether you experience postural discomfort at work, or have injured yourself playing sport or gardening at the weekend, we can help you to get on with life. Book your appointment with our city osteopaths today by calling Back in the City available to answer the phone 24/7 every day (possibly not Xmas period). Copyright Back in The City. All rights reserved.